Designed by Chad Muska. Uppers of leather, suede, abrasion-resistant TUF canvas, or duct tape-like TUF materials. Extra heel protection molded into comfortable high memory polyurethane insole. Internal neoprene toe cap and vamp for toe protection. Elastic tongue straps and thin padding with ankle support. SupraFoam midsole provides impact resistance, optimal shoe flex, and board feel. Vulcanized construction for enhanced board feel. Gum rubber outsole. Imported. Measurements: Weight: 1 lb 6 oz Product measurements were taken using size Men~s 12, width D - Medium. Please note that measurements may vary by size. Weight of footwear is based on single item, not the pair. Uppers of suede-durable TUF materials, suede, and/or leather. Padded tongue and collar for supreme comfort. High-top upper offers added ankle support. Breathable textile-fabric lining. Extra heel protection molded into the comfortable, high memory, polyurethane insole. Ultra lightweight and breathable SupraFoam midsole provides the entire foot with impact resistance and optimal shoe flex. Durable rubber outsole. Measurements: Weight: 1 lb 3 oz Product measurements were taken using size Men~s 11, width Medium. Please note that measurements may vary by size. Weight of footwear is based on single item, not the pair. 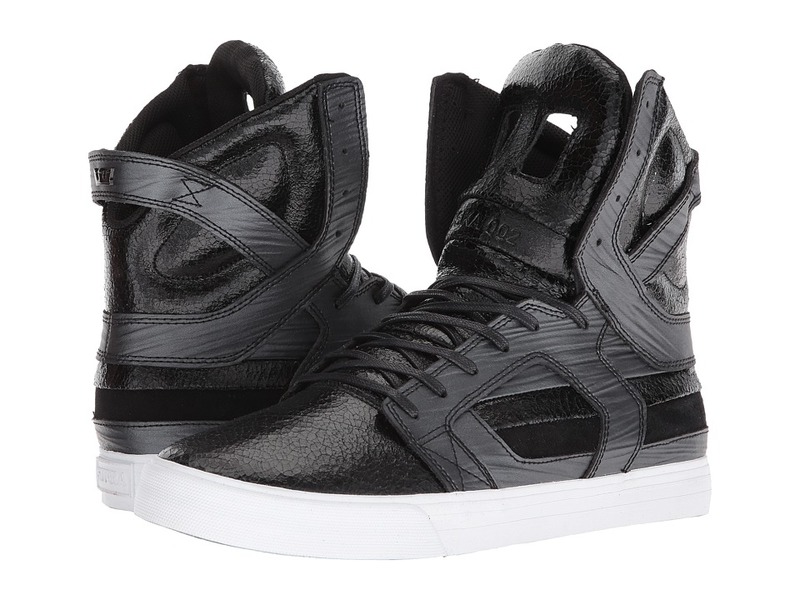 Introducing the biggest, baddest, and boldest kicks around: the Supra Skytop II. Signature shoe of Chad Muska. Clean uppers of leather or suede. Distinctive tongue design with two pull tabs. High memory polyurethane sockliner offers added heel protection. Internal neoprene sleeve for unmatched comfort, fit, and performance. SupraFoam midsole offers impact resistance, optimal shoe flex, and board feel. Vulcanized construction for a slimmed down profile and enhanced board feel. Rubber outsole for enhanced traction. Measurements: Weight: 1 lb 7 oz Shaft: 7 in Product measurements were taken using size Men~s 11.5, width D - Medium. Please note that measurements may vary by size. Weight of footwear is based on a single item, not a pair. Scaled down to size for the little guy, the Supra Skytop does not fall short of style. Uppers made of leather, suede, abrasion-resistant TUF canvas, or duct tape-like TUF material. Padded tongue and collar for a comfortable fit. Elastic tongue straps and thin padding with ankle support. Lace up closure. Gum rubber outsole. Imported. Measurements: Weight: 14 oz Product measurements were taken using size 5.5 Big Kid, width M. Please note that measurements may vary by size. Weight of footwear is based on a single item, not a pair. Designed by Chad Muska. Uppers of leather, suede, abrasion-resistant TUF canvas, or duct tape-like TUF materials. Extra heel protection molded into comfortable high memory polyurethane insole. Internal neoprene toe cap and vamp for toe protection. Elastic tongue straps and thin padding with ankle support. 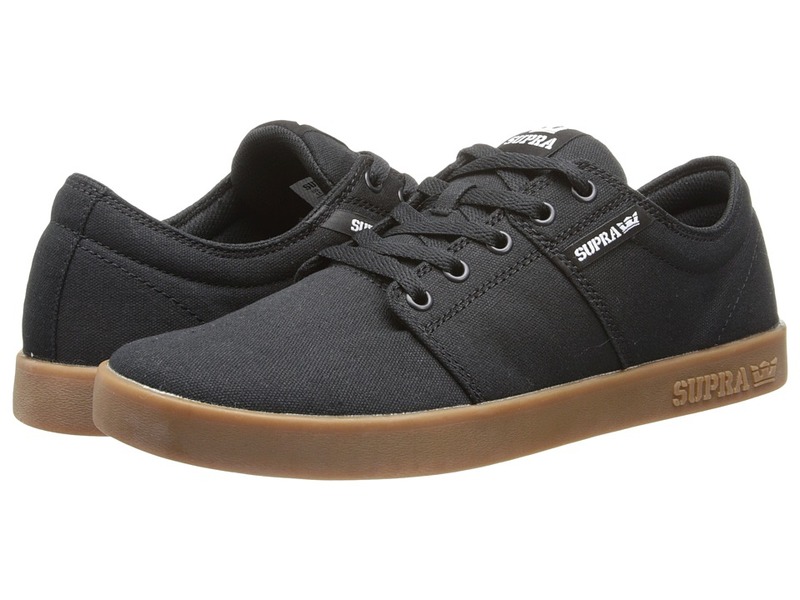 SupraFoam midsole provides impact resistance, optimal shoe flex, and board feel. Vulcanized construction for enhanced board feel. Gum rubber outsole. Imported. Measurements: Weight: 12 oz Shaft: 5 in Product measurements were taken using size 8, width B - Medium. Please note that measurements may vary by size. Weight of footwear is based on a single item, not a pair. 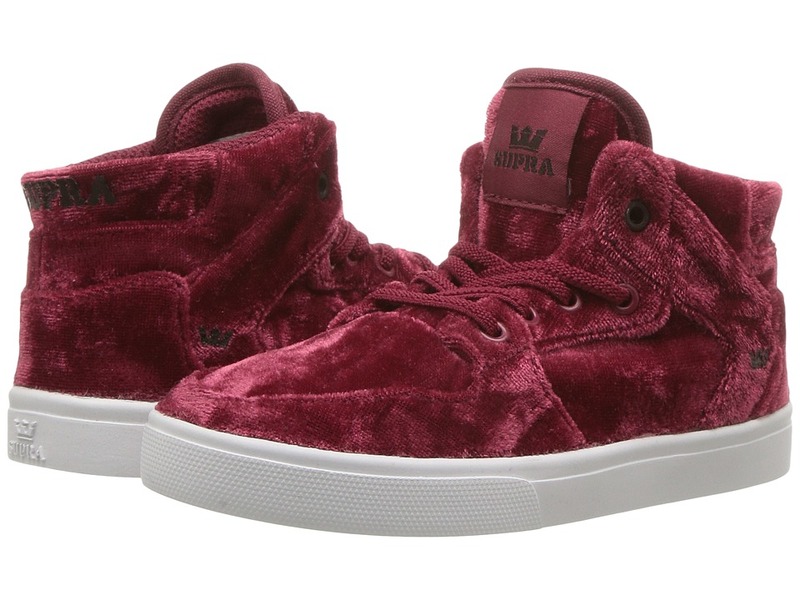 The Vaider (Toddler) from Supra, ~cause the little ones gotta stay fly, too! Leather upper. Mid-top silhouette with an extra-long tongue. Comfortable mesh lining. Elastic lace for easy on/off. Supra logo details on tongue, side, and back. Imported. Measurements: Weight: 3 oz Product measurements were taken using size 5 Toddler, width M. Please note that measurements may vary by size. Weight of footwear is based on a single item, not a pair. 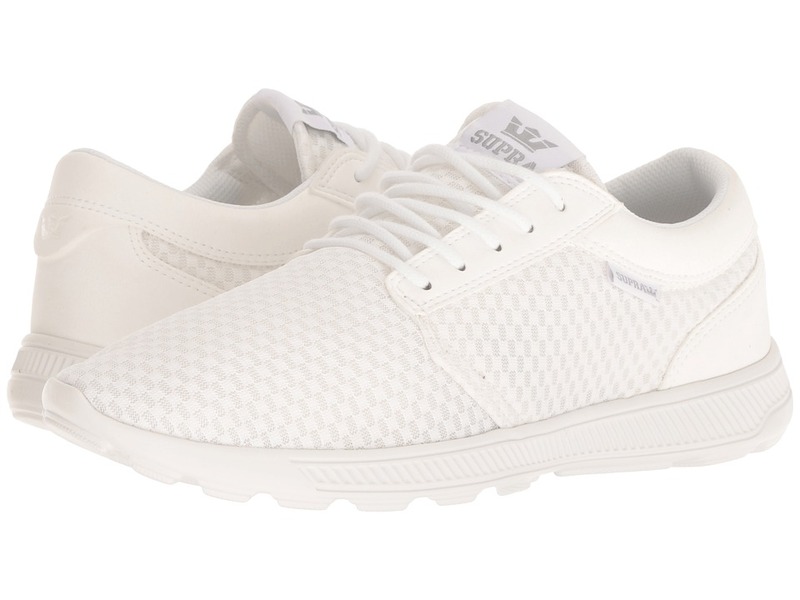 Keep your style uncomplicated and clean with the Supra Cuba! 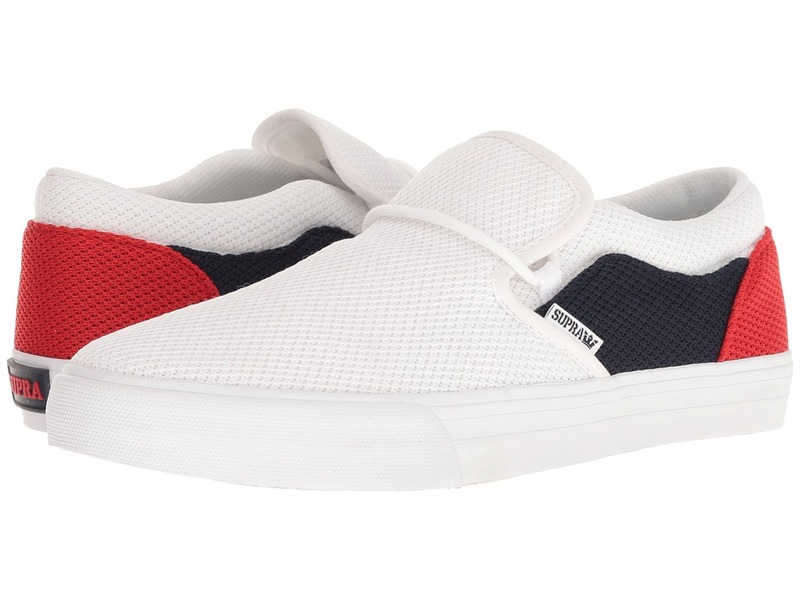 An updated version of the slip-on low top. Durable canvas upper. Minimal collar padding. Padded mesh lining for breathability. Optional rope laces. Constructed on a vulcanized sole. White foxing with pinstripe. Durable rubber outsole with repeating Supra S tread. Imported. Measurements: Weight: 11 oz Product measurements were taken using size Men~s 7, Women~s 8.5, width D - Medium. Please note that measurements may vary by size. Weight of footwear is based on a single item, not a pair. 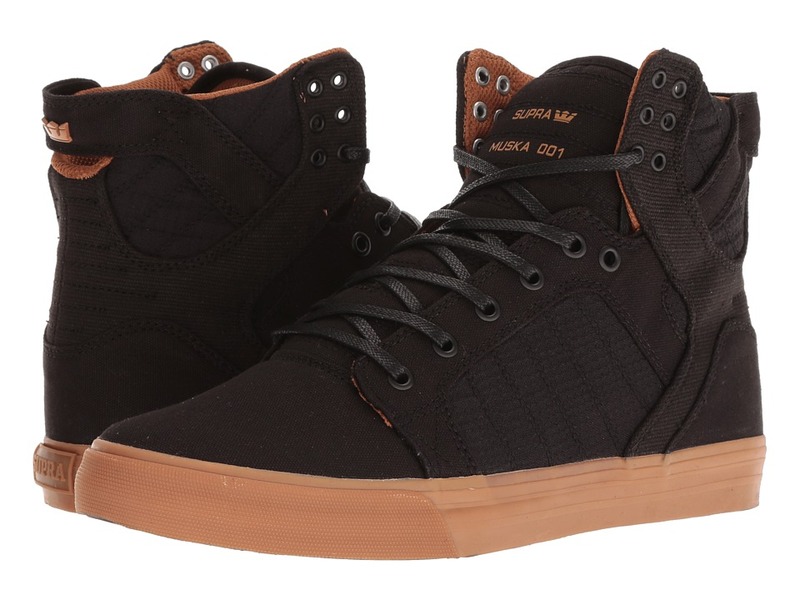 Keep reaching for the sky with the skate-ready Supra Stacks II! Low-top skate silhouette. Uppers of durable suede and canvas. Padded grey mesh lining. Lightweight cup sole supplies excellent traction and protection without compromising board feel. SupraFoam midsole provides the entire foot with impact resistance, optimal shoe flex, and enhanced board feel. Durable rubber outsole. Imported. Measurements: Weight: 11 oz Product measurements were taken using size Men~s 12, width D - Medium. Please note that measurements may vary by size. Weight of footwear is based on a single item, not a pair. Kick your athletic game into high speed with the minimalist Supra Hammer Run. Upper made with super lightweight and breathable mesh. Traditional lacing for a secure and adjustable fit. Padded tongue and collar for top notch comfort. Soft microfiber lining for a comfortable wear. Features the white SUPRAFOAM outsole technology: flexible, breathable, ultra-lightweight, does not lose elasticity, does not contain harmful adhesives, and when molded into midsole, provides unmatched cushioning and comfort. Imported. Measurements: Weight: 8 oz Product measurements were taken using size Men~s 12, width D - Medium. Please note that measurements may vary by size. Weight of footwear is based on a single item, not a pair.